The 400sf roofed area of the 1200 sf oceanside lanai is the perfect location for a small wedding, vow renewal or other ceremony, or for a gathering of family and friends. 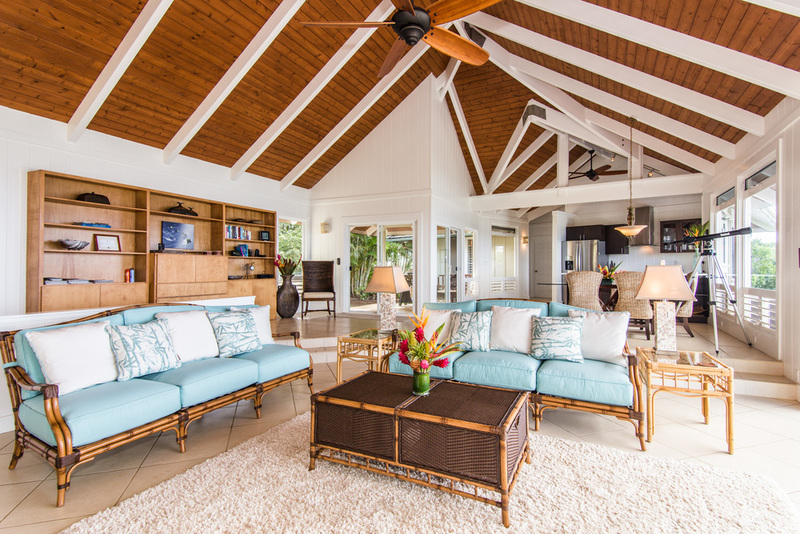 You may find that you never want to leave the lanai! Binoculars for the whales are close at hand, and the albatross cruise right by at eye level. 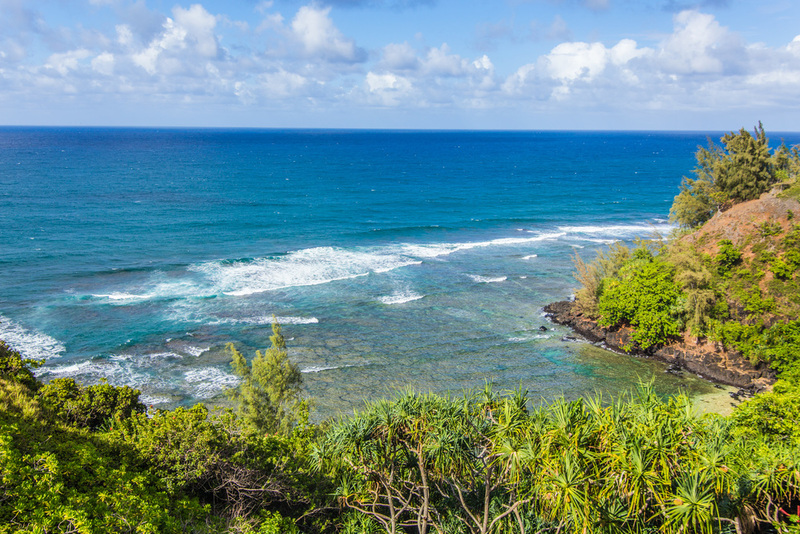 Peaceful and secluded Sealodge Beach gets "Real Gem" status in the "Kauai Revealed" guidebook. Offering sand, shade, and snorkeling, it is directly below Surf Song, about a 10 minute walk down. It is uncrowded and quite often empty. Turtles are frequently present, grazing on the reef. 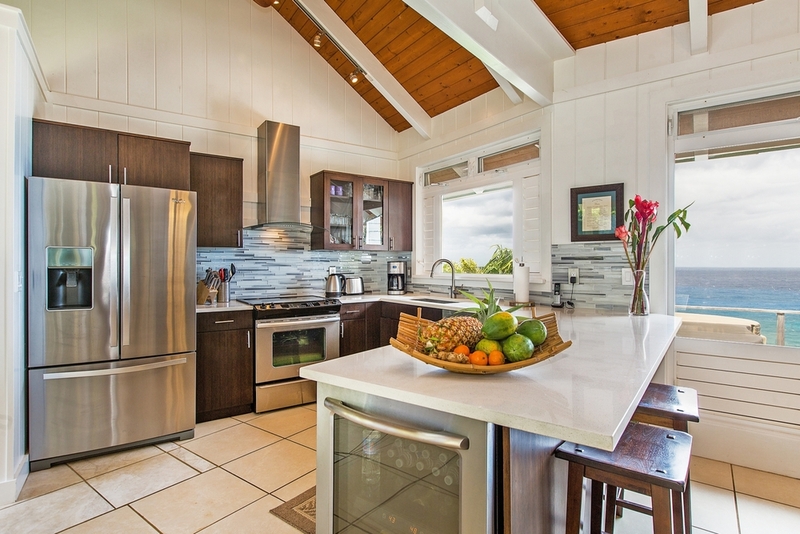 Fully equipped modern chefs kitchen has everything you need. Your welcome bottle of champagne awaits! The entertainment are features a large flat screen with expanded cable and Apple TV for access to movies and Netflix. There is a Bose sound system with Bluetooth connectivity. The desk is normally orientated towards the ocean. If you do have to work, it doesn't get much better, though the whales can be distracting! 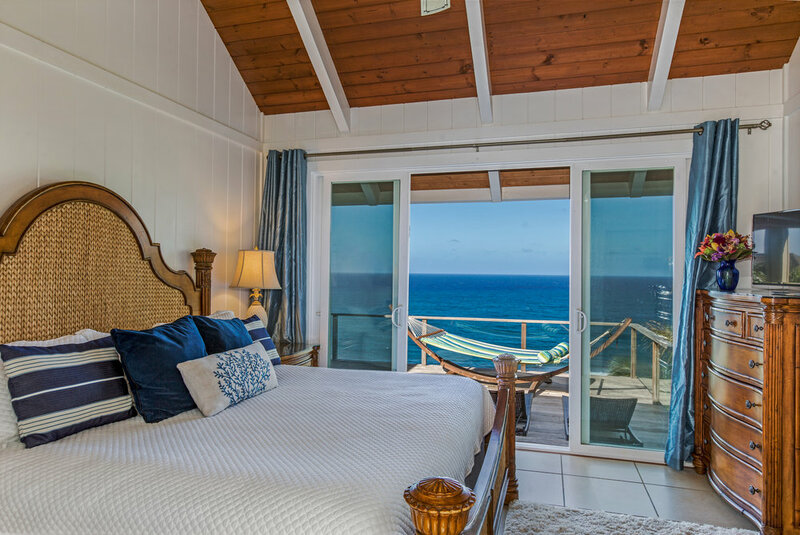 East oceanfront King master bedroom with Tommy Bahama Island Estate furniture as featured throughout the house. 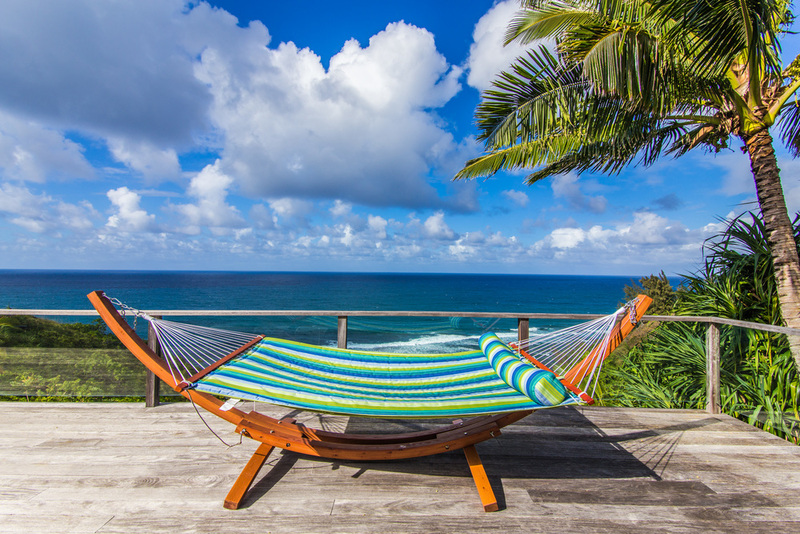 Relax and sleep to the gentle sound of surf. 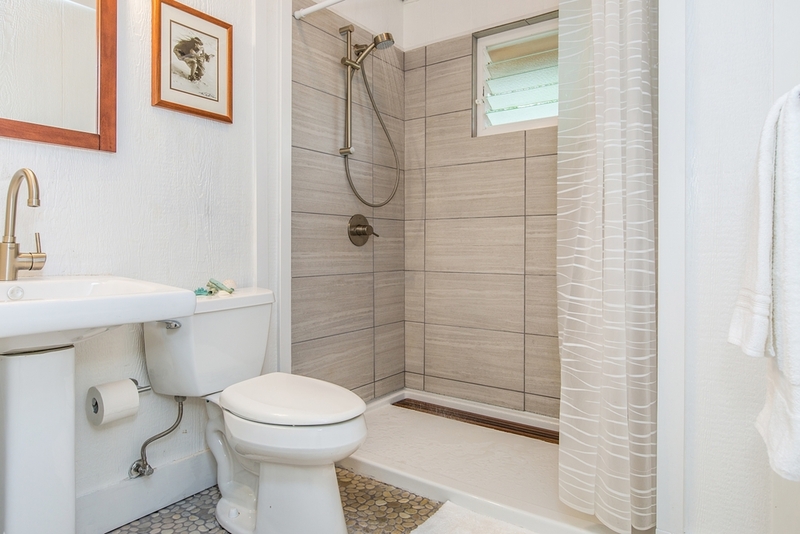 All bathrooms are newly renovated with high end features and fittings. 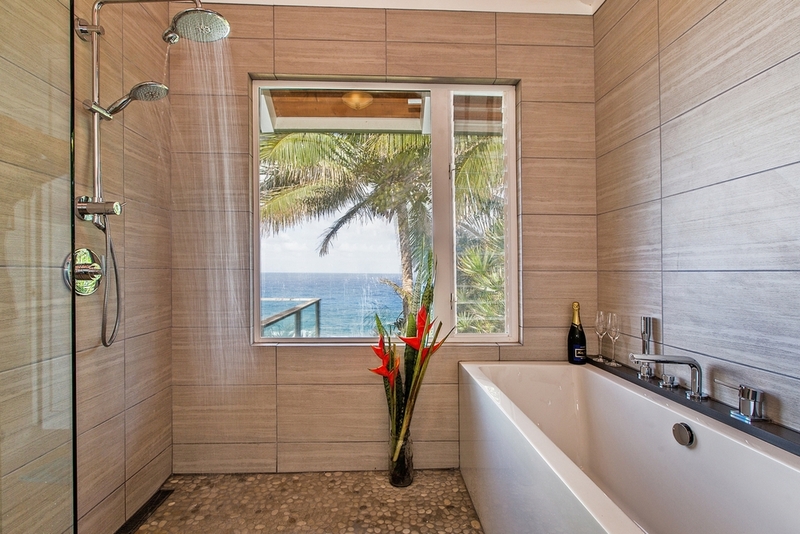 East oceanfront master ensuite features ocean view rain shower and soaker tub, and double hanging solid bamboo vanity with waterfall edge. 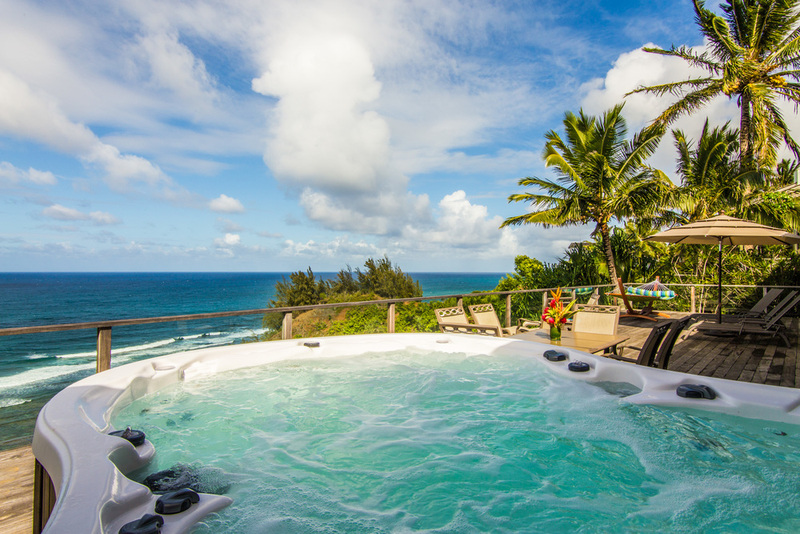 Ocean views, surf sounds and trade wind breezes for your bathing pleasure. 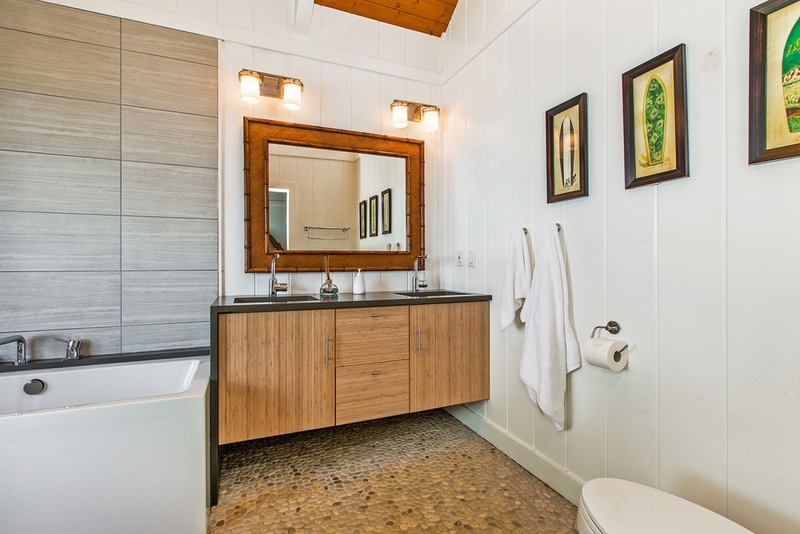 West oceanside master bedroom ensuite, indoor area, features double hanging solid bamboo and quartz vanity and one-piece toilet. 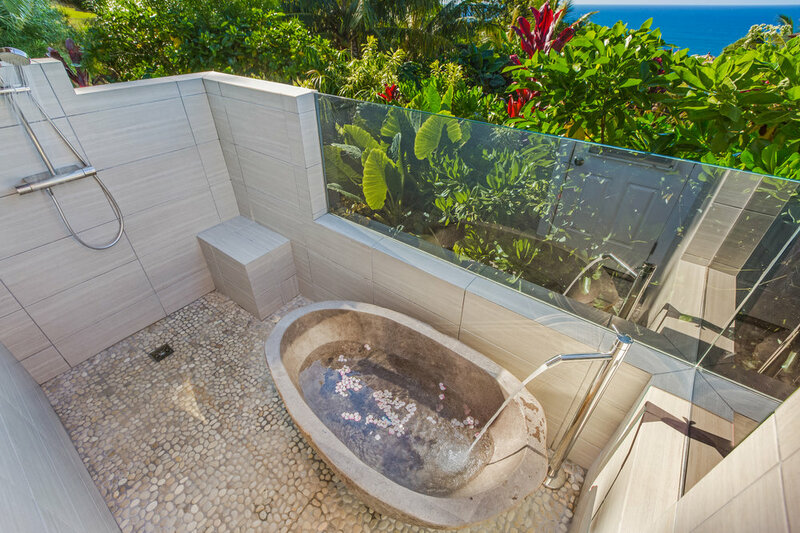 West Master ensuite bathroom outdoor area features stainless steel rain shower and Balinese stone soaker tub, both with ocean views. 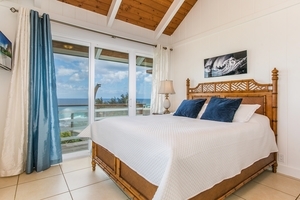 West garden side Queen bedroom has ocean views and a Bali Hai sunset view lanai. All bedrooms feature silent, individually controlled A/C. Ensuite with Kohler tub/shower and Grohe fixtures in next photo. East garden side Twin bedroom can be made up as a King upon request. This room will accommodate up to 2 additional guests. Ensuite with double size Kohler shower and Grohe fittings is shown in the next photo. 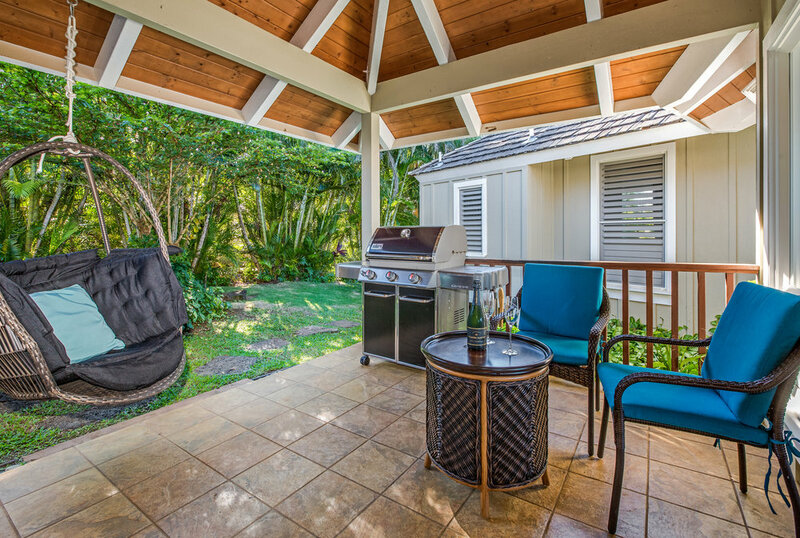 The shaded garden side lanai is the perfect place to relax with a book in the Balinese hanging chair, and to barbecue on the new large gas Weber. 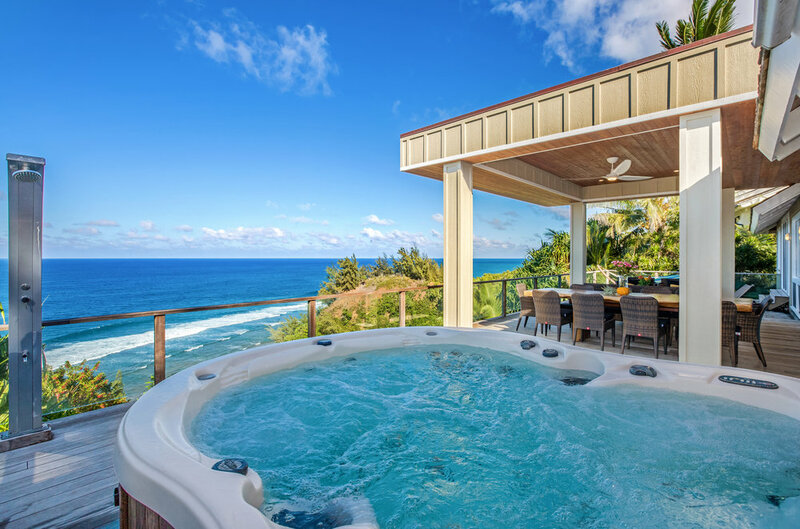 Surf Song, in Princeville Kauai, is a luxury private licensed vacation rental home with four air conditioned bedrooms and four ensuite bathrooms. 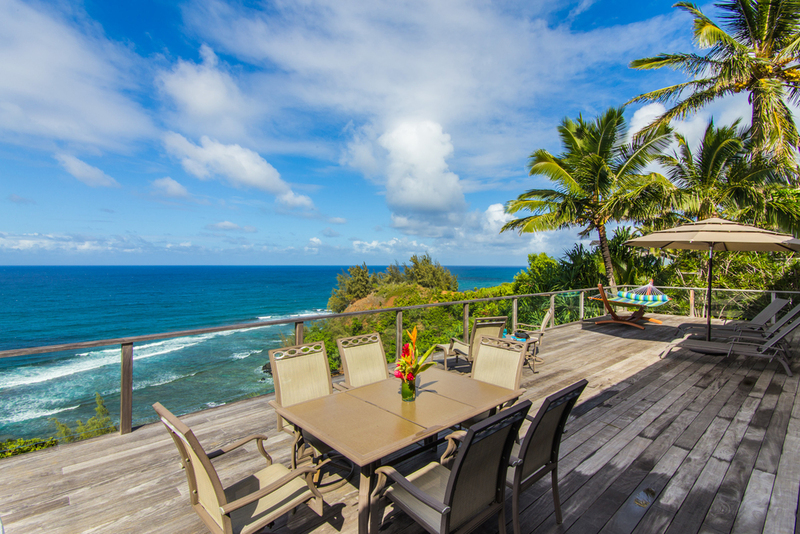 It is situated on a bluff overlooking the Pacific ocean on the iconic North Shore of Kauai. Enjoy ocean vistas from almost every room of this pristine, modern yet tranquil home while listening to the relaxing sound of waves breaking on the shore below. 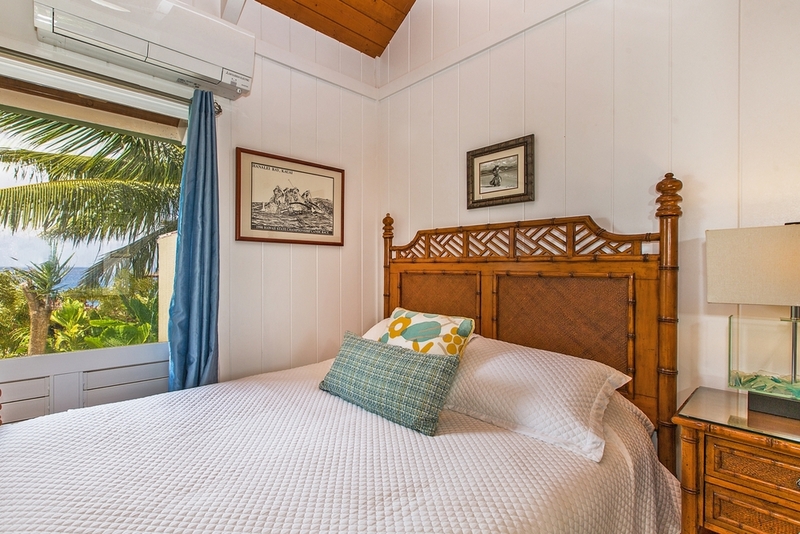 With a 10 minute walk to a secluded beach, yet within a pleasant walk or bike ride (plenty of bikes provided) of Princeville's full facilities, this is the perfect retreat. 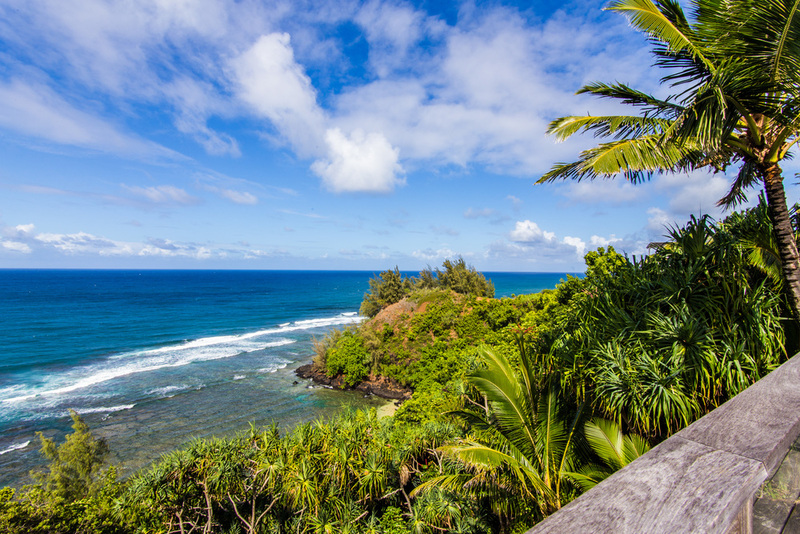 So many of the beautiful places and beaches that Kauai has to offer are close at hand, but you may just find that all you want to do is stay and enjoy! 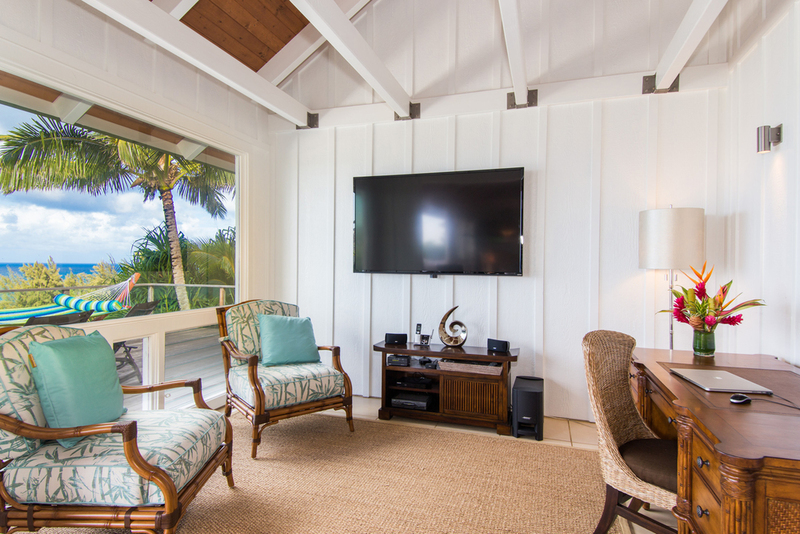 Surf Song is centered on an expansive, vaulted great room which opens fully to the wide oceanside lanai. 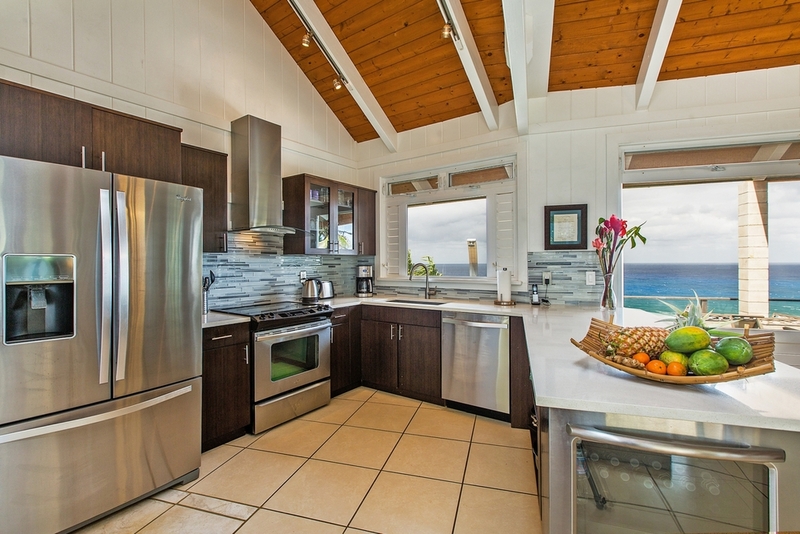 Adjacent on the ocean are an ultra modern, fully equipped chef‘s kitchen and an entertainment area with new, high-end electronics. Two oceanfront master suites offer ocean sights and sounds from both bedrooms and bathrooms. 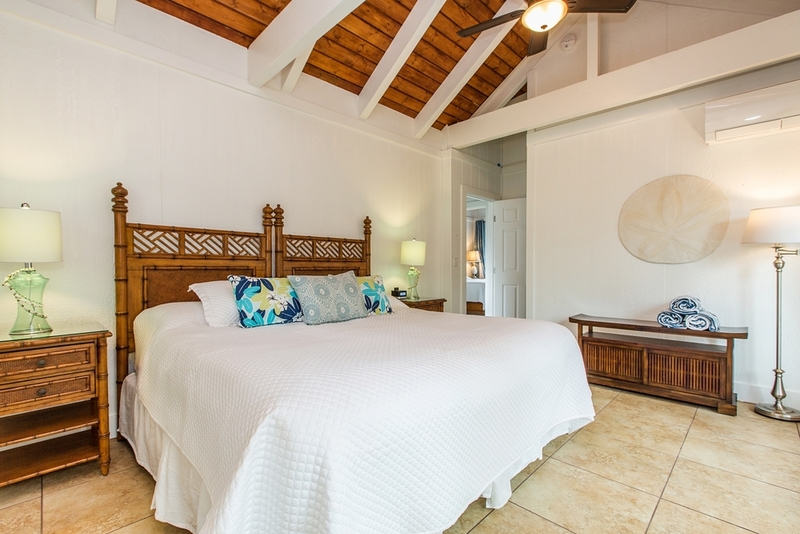 All four bedrooms are air-conditioned with silent, individually controlled systems. 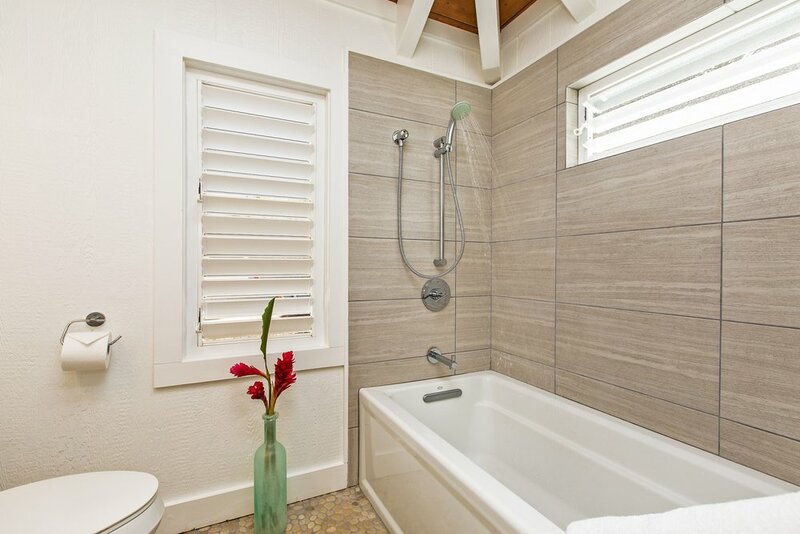 Each has a luxury, modern ensuite bathroom with pebble floors and Kohler/Grohe fixtures. 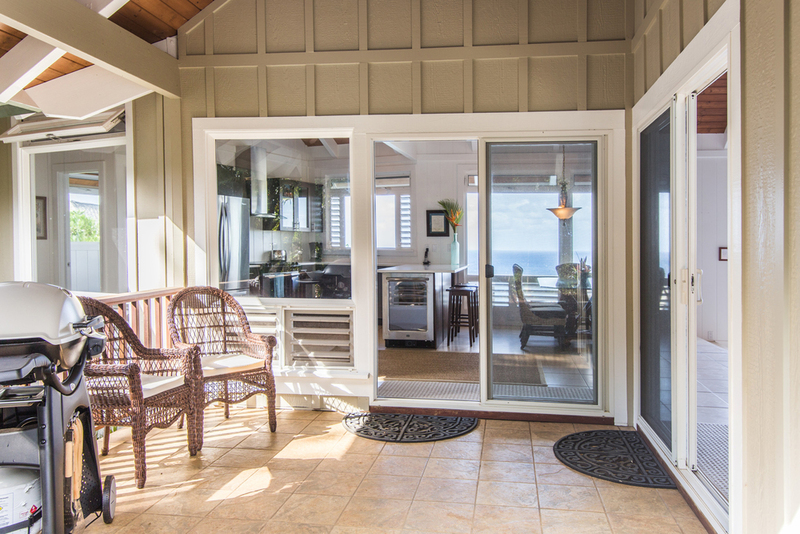 Each has sliding doors opening to a lanai. 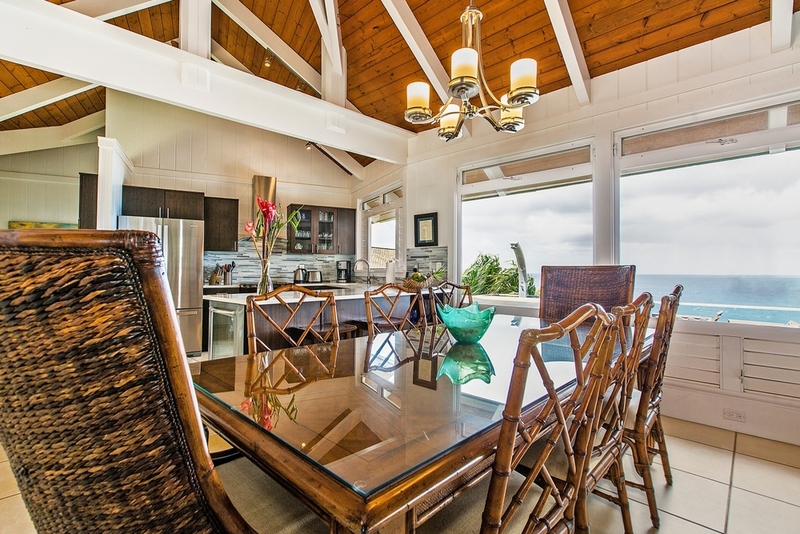 The home is equipped throughout with top of the line, genuine Tommy Bahama furniture. The atmosphere is one of casual, Plantation - style elegance. Full concierge services are available; Ocean or land activities, massage or private yoga on the oceanfront deck or private chef. Please ask the owner for more details. We would be delighted to help. 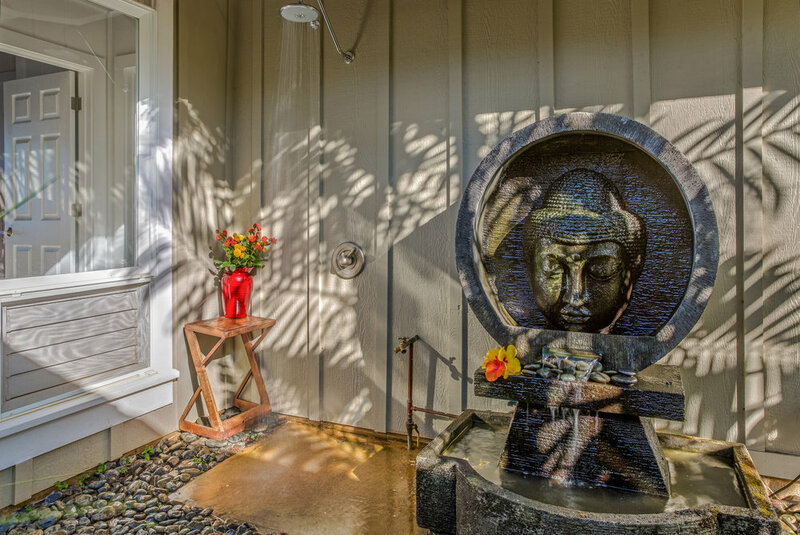 For reservations and availability please view our calendar on VRBO or contact us. 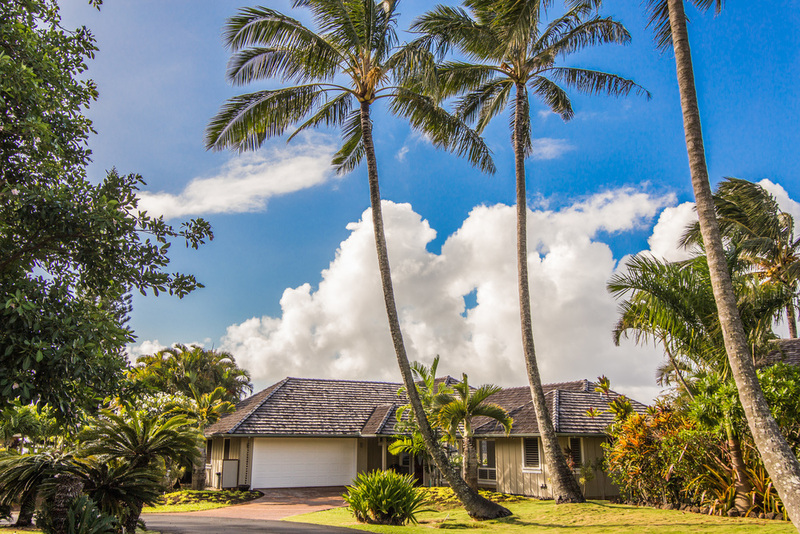 Once you arrive at Surf Song, at the very end of a peaceful, exclusive cul-de-sac, see the fabulous location and glimpse the ocean beyond, you will know that you chose wisely. On entering the home, you will be greeted by the expansive ocean view shared by almost all the rooms in the house, and the gentle sound of surf breaking on coral in the pristine bay below. 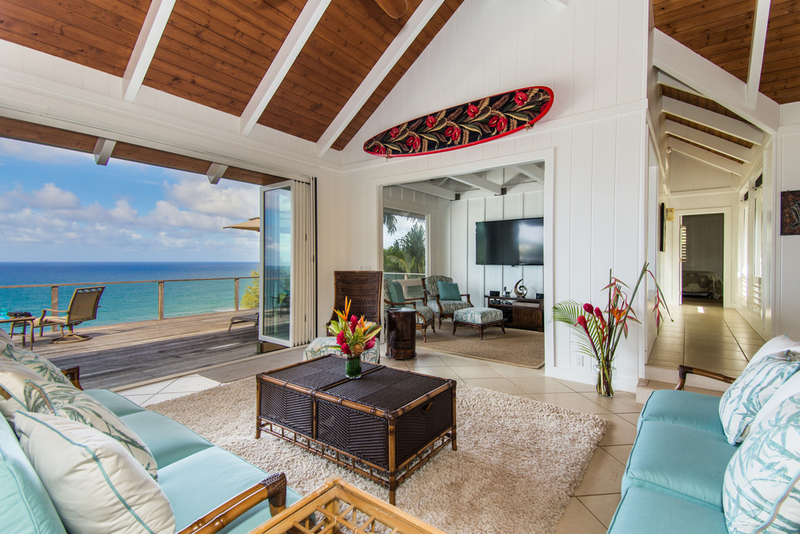 "Gorgeous view, beautiful house - loved Surf Song!" "Amazing home for a fantastic vacation"
"Exceptional Home, Beautiful Views, and Great Owners!" If you have any questions about the property, please don't hesitate to contact us! To check our availability, please view our calendar at VRBO.